Inflation forecasting is of paramount importance for the conduct of monetary policy. Since monetary policy transmission is associated with significant lags, central banks aiming to achieve price stability need to be forward-looking in their decisions as well – which underscores the importance of inflation forecasting. Hence, the formation of expectations is central to the question of what drives (and helps predict) inflation but also to policymaking. While much research has focused on the challenges of inflation forecasting during the last few decades in advanced economies (Faust and Wright 2013), much less attention has been paid to emerging market economies (EMEs), which have witnessed great changes – attributed to shifts in monetary policies (like the adoption of inflation targeting) and globalisation, among other factors. All these changes pose a significant challenge for inflation forecasting. Our findings provide a novel insight on inflation forecasting based on the experience of a large sample of EMEs (Figure 1). Notes: SAAR denotes seasonally-adjusted, annualized rate computations of the quarter-over-quarter growth rate. The shaded area defines the period each country operated under a de jure or de facto inflation-targeting scheme based on information from Roger (2010) and Hammond (2012). We also include a value corresponding to the index of central bank independence (CBI) proposed by Garriga (2016) for each country whereby a higher value closer to one by this measure indicates a more independent monetary policy framework. We follow the convention on hyperinflations in the literature introduced in Phillip Cagan's 1956 book The Monetary Dynamics of Hyperinflation: we define an episode of hyperinflation as the period when inflation is above 50% monthly (which corresponds to approximately 250% at quarterly frequency) and cap the vertical axis of each subplot accordingly. The only country in our sample that shows a distinct episode of hyperinflation in our sample is Peru during the late 1980s and early 1990s. The existing literature focusing on inflation forecasting for EMEs has produced few studies, with only a limited number of countries and short time coverage (notably, Aron and Muellbauer 2012 and Medel et al. 2016 to mention just two; Mandalinci 2017 is the exception). In our own research (Duncan and Martínez-García 2018), we use a broad sample of EMEs with ample cross-sectional coverage and an extensive time series encompassing a number of business cycles (going back to the 1980s in most cases). The determinants of inflation in a globally interconnected world remain a much-debated part of the discussion among policymakers and scholars (IMF 2016, Borio 2017). Firms and households take into account the expected rate of inflation when making economic decisions that ultimately affect the realised inflation rate, such as when setting prices for goods and services or when negotiating wages in a global marketplace. An important theoretical relationship that formalises and summarises the forward-looking behaviour of price-setters is the open economy New Keynesian Phillips curve (Martínez-García and Wynne 2010, Martínez-García 2017). However, we investigate a wide variety of forecasting models – beyond Phillips curve-based specifications. Atkeson and Ohanian (2001) show that a naïve model – a variant of the random walk model (RW-AO) based on past realisations of inflation alone – often outperforms standard models such those based on a closed economy Phillips curve (amongst advanced economies, see also Stock and Watson 2007 and Faust and Wright 2013, among others). The open economy Phillips curve appears to be more successful at predicting inflation amongst industrialised economies, suggesting that conventional Phillips curve models are too restrictive in not recognising the role of globalisation (Duncan and Martínez-García 2015, Kabukcuoglu and Martínez-García 2018). Yet, the strand of the literature on inflation forecasting for EMEs has mostly ignored the RW-AO benchmark to begin with. The RW-AO specification does not appear in the list of forecasting tools used by central banks around the world – many in EMEs – that use inflation targeting either (Hammond 2012). Based on our extensive empirical analysis, we argue that central banks in many EMEs seem to be making an important omission for inflation forecasting by setting aside the RW-AO model. Such a model, a moving average of the past four observations of the quarter-over-quarter inflation rate, is shown to outperform more complex and rich models for inflation forecasting – not just in terms of the root mean square prediction error (Figure 2a), but also in terms of directional accuracy (Figure 2b) – even those that are motivated by the Phillips curve relationship. Among the competing models beaten by the RW-AO model, univariate and multivariate factor-augmented models can be regarded as second-best options under the same metrics of predictive accuracy. In contrast, we find that certain variables such as exchange rates and commodity prices do not seem to contribute much to predicting inflation in the EMEs in our sample (many of which are small open economies). Our findings illustrate that a simpler adaptive forecasting strategy like that of the RW-AO model can be preferable to other more structural approaches – such as those based on the Phillips curve – for forecasting inflation, because this strategy is often robust to many different forms of misspecification and unmodeled structural breaks (Giraitis et al.2013). In fact, we find the RW-AO model difficult to outperform unless we include subjective forecasts, which might incorporate perceived structural shifts in the data generating processes. We show that forecasting by averaging or down-weighting past data in a simple way as we do with the RW-AO model, without engaging in further modelling, appears to be a viable strategy for predicting inflation in the probable presence of unknown structural breaks. Moreover, this robust strategy offers a general approach to also handle trends in the data for which we have limited knowledge about their nature. 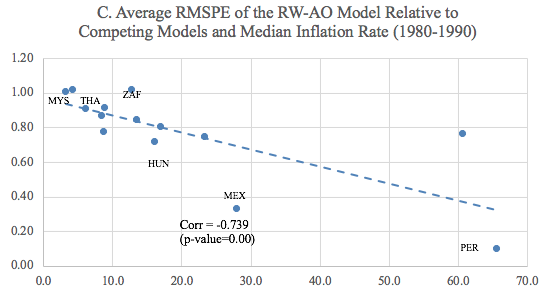 In this sense, we argue that the RW-AO model is the empirically-relevant benchmark to beat and a harder yardstick to overcome for any proposed model of inflation forecasting for EMEs. 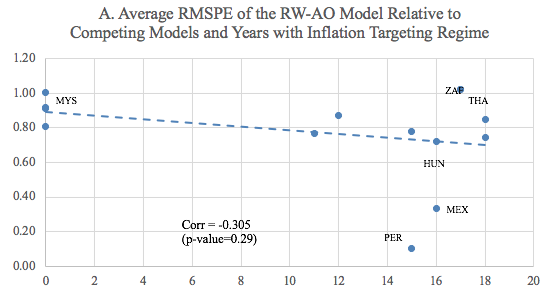 Our evidence shows that inflation appears easier to forecast with the RW-AO model, and yet the RW-AO’s robust performance is harder to interpret in theory. Our findings seem to challenge well-known economic-based models for inflation forecasting – even Phillips curve-based specifications that otherwise are shown to work well for some countries (mostly advanced economies). The recent literature, mostly focusing on industrialised economies, casts the Phillips curve and its predictions in a more positive light than Atkeson and Ohanian (2001) did – in part by explicitly incorporating the open-economy dimension to Phillips curve-based models (Duncan and Martínez-García 2015, Kabukcuoglu and Martínez-García 2018). 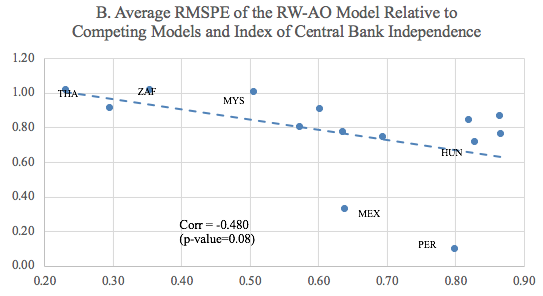 However, our empirical evidence for EMEs supports the idea that, even when the open economy Phillips curve holds, a lack of credibility in monetary policy might be partly behind the relative success of the RW-AO model in some countries compared to others. We illustrate the comparative forecasting performance of the RW-AO model with Figure 3, which plots in the vertical axes the average of the ratios of root mean square prediction errors of the RW-AO model, relative to the competing models. This average is calculated over the nine alternative models and four forecast horizons for each of the 14 EMEs in our sample. On the horizontal axes, we measure four different proxies of lack of credibility in monetary policy in the past – the number of years under an inflation-targeting scheme (Figure 3a), an index of central bank independence (Figure 3b, using the index proposed by Garriga 2016), the median inflation rate computed over annualized quarter-over-quarter inflation rates between 1980Q2 and 1989Q4 (Figure 3c), and the coefficient of variation of the annualized quarter-over-quarter inflation rates calculated over the 1980Q2-1989Q4 period (Figure 3d). Notes: The average RMSPE of the RW-AO model relative to competing models is calculated over the 9 alternative models and 4 forecast horizons for each economy. 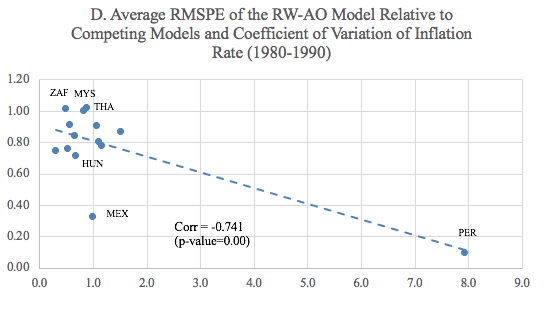 Values less than one imply that, on average, the RW-AO model has a lower RMSPE than does the competitive model. The number of years under inflation targeting is calculated from 1999 to 2016 (the forecast period) using information from Hammond (2012) and Roger (2010). The index of central bank independence is an average for each country using data from Garriga (2016). 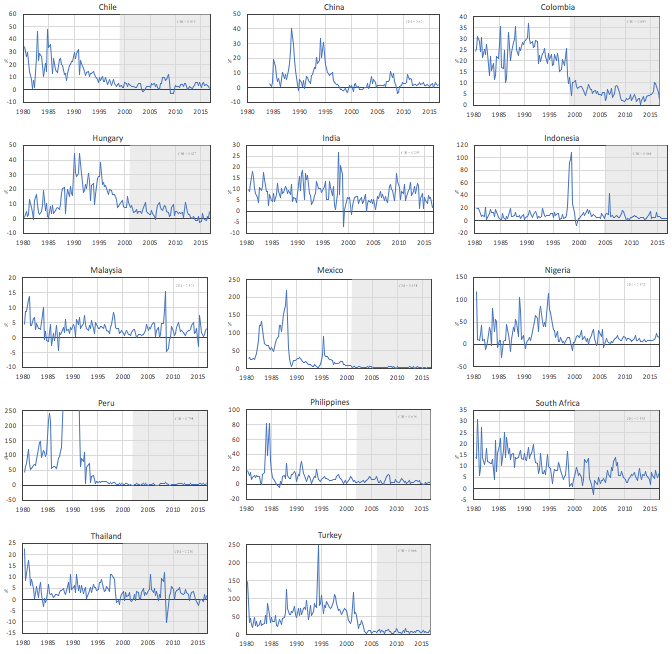 The median inflation rate and the coefficient of variation are computed over the quarter-over-quarter inflation rates between 1980Q2 and 1989Q4 for each economy. Labels in graphs correspond to Hungary, Mexico, Peru as well as Malaysia, South Africa, and Thailand. The lack of credibility of central banks’ policies during the 1980s is reflected in high inflation levels and highly volatile inflation rates during that period. Likewise, the poor credibility in the past has probably induced central banks to adopt, sooner or later, institutional changes such as inflation-targeting regimes or statutory improvements that seek independence from central governments or other external influences. In the absence of accurate indicators, these variables relating to the adoption of an inflation target and gains in central bank independence work as imperfect measures of a lack of credibility. Our view expressed is that the higher the values of any of these proxies, the lower the degree of credibility in the central bank’s monetary policy. Given this in the period under study, the low credibility in the past might be what prompts the adoption of inflation targeting or greater central bank independence, aimed at improving the central bank’s credibility. Figure 3 provides the sign of the correlations between these proxies for past credibility and the forecasting performance of the RW-AO model, and the corresponding p-values. Even though there are some influential observations and the sample size is small, the relationships depicted are suggestive and consistent with the view that the predictive ability of the RW-AO model is better in economies that experienced low credibility in the past, relative to its competitors. These EMEs tend to display jointly lower relative predictive ability of the RW-AO model and relatively higher monetary policy credibility. Hence, our evidence supports the idea that the lack of credibility might be partly behind the relative success of the RW-AO in some countries compared to others. In the paper, we also argue that under lack of credibility in the inflation target, a Phillips curve can imply inflation dynamics that produce permanent (or near-permanent) effects in the inflation rate from transitory changes in the output gap that resemble those observed in many EMEs during the 1980s and part of the 1990s. The gradual recovery of the confidence in the central bank’s policies and its commitment with an inflation target may lead inflation dynamics to display patterns more similar to those stationary-looking processes observed from the late 1990s on. The inability of forecasters to observe sudden shifts in credibility or frequent changes in the implicit target makes the empirical modelling and forecasting of inflation a difficult task, particularly among EMEs. Finally, our findings motivate us to look for alternative ways to model inflation among EMEs. We suggest that understanding the process that leads to the formation of expectations and the appropriate conduct of monetary policy under different credibility scenarios can be important. Therefore, explicitly incorporating the formation of economic agents’ inflation expectations under imperfect credibility of the inflation target into our forecasting models is a promising research avenue, which – although complicated due to data availability – we aim to investigate further in the future. Aron, J, and J Muellbauer (2012), “Improving Forecasting in an Emerging Economy, South Africa: Changing Trends, Long Run Restrictions and Disaggregation”. International Journal of Forecasting 28, 456-476. Atkeson, A, and L E Ohanian (2001), “Are Phillips Curves Useful for Forecasting Inflation?”, Federal Reserve Bank of Minneapolis Quarterly Review, 25 (1), 2-11. Borio, C E V (2017), “Through the Looking Glass”, The Official Monetary and Financial Institutions Forum (OMFIF) City Lecture, London, 22 September 2017. Duncan, R, and E Martínez-García (2015), “Forecasting Local Inflation with Global Inflation: When Economic Theory Meets the Facts”, Federal Reserve Bank of Dallas Globalization and Monetary Policy Institute Working Paper No 235. Duncan, R, and E Martínez-García (2018), “New Perspectives on Forecasting Inflation in Emerging Market Economies: An Empirical Assessment”, Globalization and Monetary Policy Institute Working Paper no 388. Faust, J, and J H Wright (2013), “Forecasting Inflation”, Handbook of Economic Forecasting, Volume 2A, Chapter 1, 2-56, Elsevier. Garriga, A C (2016), “Central Bank Independence in the World: A New Dataset”, International Interactions 42 (5), 849-868. Giraitis, L, G Kapetanios, and S Price (2013), “Adaptive Forecasting in the Presence of Recent and Ongoing Structural Change”, Journal of Econometrics,177 (2), 153-170. IMF (2016), “Global Disinflation in an Era of Constrained Monetary Policy”, World Economic Outlook, Chapter 3, 121-170. Kabukcuoglu, A, and E Martínez-García (2018), “Inflation as a Global Phenomenon—Some Implications for Inflation Modelling and Forecasting”, Journal of Economic Dynamics and Control, 87 (2), 46-73. Mandalinci, Z (2017), “Forecasting Inflation in Emerging Markets: An Evaluation of Alternative Models” International Journal of Forecasting, 33 (4), 1082-1104. Martínez-García, E (2017), “Good Policies or Good Luck? New Insights on Globalization and the International Monetary Policy Transmission Mechanism”, Computational Economics, 1-36, September 15. Martínez-García, E, and M A Wynne (2010), “The Global Slack Hypothesis”, Federal Reserve Bank of Dallas Staff Papers, No 10. Medel, C A, M Pedersen, and P M Pincheira (2016), “The Elusive Predictive Ability of Global Inflation”, International Finance 19 (2), 120-146. Stock, J H, and M W Watson (2007), “Why Has U.S. Inflation Become Harder to Forecast?”, Journal of Money, Credit and Banking, 39 (2), 3-34.